Happy weekend! I was thinking lately, it seems like every time I try and find a new place to eat at in the city it's actually really hard to find anything good. A lot of search results bring me to either big, tourist-y trap joints or really really high-end dining places. It's bananas. You need to either ask fellow New Yorkers or do some scouting by walking around the streets, and that's the truth! That's why I'm putting together some of my favorite eating spots, so you know some tried-and-true mid-range dining options from a girl that's done the leg work! I'm not a foodie type, but I definitely enjoy a good meal. Lately, when I'm around the city I try and avoid two things: going to restaurants I've been to before and going to chain restaurants. What's the point of eating at the Applebee's in Times Square when you're in the greatest city on Earth? NYC is definitely more expensive than most places-- I would say an average lunch will run you $15 and dinner maybe $25-$30. Keep that in mind (it's one of the major reasons I try and reserve eating out to when I'm with other people) because it's easy to get sucked into paying way more if you're from out of town and want to avoid ending up at an outrageously expensive place that's geared towards people who don't know better. Below are some of my best restaurant recommendations, in no apparent order. I'll list if they're better for lunch or dinner, any special things to know, and whether it's sit-down or more fast-casual. These are the places I recommend any time a friend asks me for spots, so hopefully this can help you too-- regardless of if you're coming into town on a vacation or live here and just want some new places to try! I tried to avoid the really well-known typical places and list joints you wouldn't really know unless you live in the city and have visited yourself. For part two of this post, featuring even more restaurant recommendations, click here. I found this place one day when I was deep in a Google search for Italian restaurants in SoHo, lol. It turns out this place is a real gem! Both of the times I've went I have ordered the same thing (because they do it just that good), penne alla vodka. 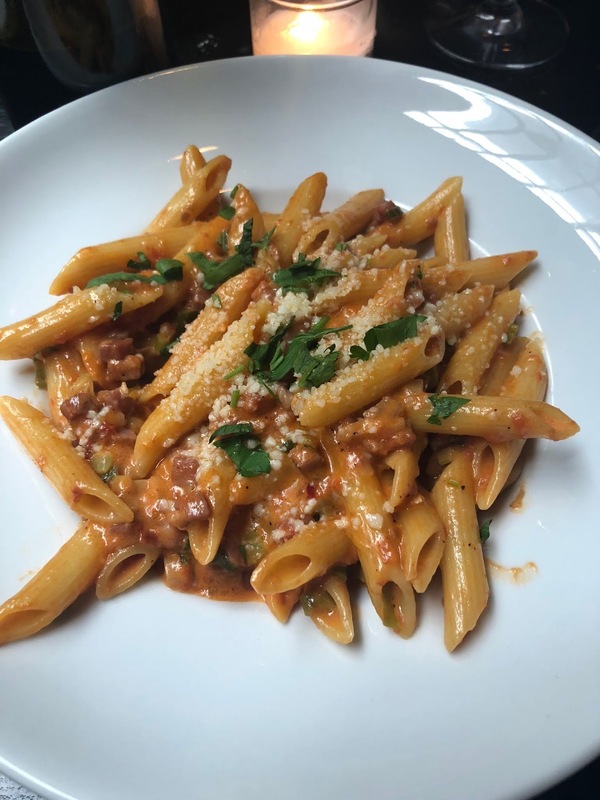 I'm CONVINCED Galli has to make one of the BEST penne alla vodkas in the whole city, and mind you I'm a pretty tough critic! The ambiance is fantastic and it's a great place to meet friends after work. It can get very busy though, so definitely make a reservation ahead of time. Located on Mercer street right by all the trendy designer stores, this place matches up to that Soho-stylish feel everybody loves so much. The bar gets crowded but luckily there is a good amount of seating in the back under a beautiful glass ceiling that lets just enough sky in. The exposed brick walls and rap/r&b music add to the young, stylish vibe. Tip: Mondays if you go in with 4 or more people, you get a free bottle of wine! This was one of my main spots back in the day! When I used to dorm at my school I would come here all the time. Located close enough to Times Square that it's convenient, but far enough that it's not crowded with tourists, this is where you can get some mean soup dumplings and pan-fried pork buns. Prices are very affordable considering its location. The place is kind of small though, so definitely expect a wait, especially if you're with a bigger party. It's definitely a Chinese family styled place (although you can get single servings of noodles), so if you're with other people order a few things and share. Kung Fu Steamed Buns Ramen is a very affordable, casual place. I love Bauhaus because I'm a big fan of guàbao (挂包) and it's a food that's harder to find in NYC, although it is trending right now. Guàbao are a Taiwanese food that is a steamed bun sliced open and filled with meats, vegetables, and a sauce. Due to the guàbao trend, you'll find that these tiny versions can actually be very expensive. Back in Taiwan, I pay maybe $2 for a big one. Here in the city a little one from Bauhaus is $5.50. I get that it's specialty but it always makes me feel like I'm being bamboozled (because I am!). Anyway, Bauhaus is still a recommendation on my list because it is a trendy, kind of streetwear-feeling joint with yummy guàbao and an edgy interior. The place has very limited seating, so if it's a nice day you may consider buying your meal and walking over to Union Square to eat it. Here's the deal, the more I go to By Chloe the more I find that it can be very hit or miss. I went through a phase where I would go all the time, and usually I would get either the burger, quinoa taco salad, or the mac and cheese. There are other things (obviously) but I have tried some others and not liked them at all really. By Chloe is VEGAN, and while that's not my thing I will admit this place is pretty good in not being just for vegans. I recommend ordering one of my three usuals, and also going to the location on Bleeker because it's right next to Sweets by Chloe, and that place is GREAT! It sells a variety of baked goods and drinks (all vegan too) and they taste amazing. By Chloe is what I consider to be an Instagram place, which is something that always makes me wary. Anywhere that puts too much of an emphasis on aesthetics makes me think that attention is taken away from the food. Luckily, I think this place is equal parts Instagrammable and yummy, and is perfect for a hip, casual lunch. I found this place while walking around with a friend (which is in my opinion the best way to find new spots). We had met for lunch and wanted to survey the area for a place to eat. We ended up at Tre Giovani, a very stylish Italian joint located in the NYU/Washington Square Park vicinity. I again ordered one of my favorite pasta dishes, here called penne rose carbonara, and it was also fantastic. The place is a small and decorated in a kind of rustic, homey way. I loved the feeling in there and the staff was very nice. I went in the afternoon when it wasn't so busy, but even in the evening I could see it as being lively but not too loud. This would be a great place for date night or maybe for taking clients out to dinner. I'm sure you've seen the Facebook videos of this place's specialty menu item: the giant soup dumpling that people put straws in to drink up. I actually find that to be excessive and disgusting, so the thought never crossed my mind to go out of my way and visit this place. However, last week I was walking around with Amos, my friend and main photographer, and we ended up right in front of Drunken Dumpling! I was in the mood for some soup dumplings anyway so in we went. The soup dumplings (normal sized) were delicious and the pan fried pork buns had an interesting sweet taste on the bottom, we think it was like maple syrup or something. Regardless, the place is affordable and yummy. It's small so seating could be tricky during peak dining times, but I had no trouble getting a table on a Tuesday night. It's the kind of place where you order at the counter and wait for them to bring it to you at your table. So this is not technically a restaurant... BUT I can tell you there have been many a times where I go into ViVi and treat its fried chicken like it's a lunch meal, lol. I used to be very obsessed with the spicy popcorn chicken because it really does taste just like how they make it at Taiwanese night markets. If you don't feel like a whole meal for lunch, just head over to Vivi and order a tea and a bag of popcorn chicken and you'll be good to go. This is a super fun bubble tea spot with a lot of drink variety, and it has a bunch of other Taiwanese snacks like Taiwanese sausage! There are many different locations across the city, most have very limited seating and usually it's not the type of place where you'd stay more than 45 minutes max (enough time to drink your tea and eat a snack). My favorite location is the one I consider at the end of Hell's Kitchen but online says Midtown! Listen to me very closely on this one: there are many diners in Manhattan that will play you for an absolute FOOL. I can't tell you how many times I've seen a Manhattan diner charge outrageous prices to unknowing tourists, it's actually repulsive (AVOID the 57TH STREET BROOKLYN DINER AT ALL COSTS). But, here's a diner that's amazing if you want a late night meal after hitting the bars or just feel like breakfast for dinner, Olympic Flame Diner. The prices here are totally fair, the food and service is great, and the staff is clearly hardworking and very friendly. I love this place and have some great memories from here. My friends and I used to order from this diner all the time from school, or we'd all get breakfast here on a Saturday. I remember first finding out about BBQ Olive Chicken from Facebook, it was in one of those food trend videos. The highlight was due to its opening a new location in K-town and its alternate frying method using olive oil. There is a street level that is fast casual, where you pick your meal pre-made off a wall and grab a table. The basement level is more of a bar atmosphere with a bar area and then the rest is seated dining. I have tried both, and for me the basement is too noisy and the dining experience can be awkward if you get one of the couch/coffee table set ups (distance is weird from table to couch). I love its chicken though, the classic is sure to be a crowd pleaser and the flavored options are delicious as well! Very fun, young atmosphere. I can't say enough about Freda's! If you're looking for some delicious Caribbean/Soul food that comes in generous servings at an affordable price, you really should be looking no further. I get the jerk chicken meal from here with sweet potatoes and mac & cheese and I'm really SET! It feels very cozy and is definitely the move for Caribbean. They have different desserts sometimes on rotation, I got the red velvet cake and it was super yummy, had to take it home though because it was a big slice and I was already full from dinner! Eating here was my first time trying Haitian food ever, and it was FANTASTIC! The joint is small and homey, with enough seating where I wouldn't worry about not being able to get a table. I ordered the soursop milkshake (it's hard finding soursop anything in NYC) and it was great, reminded me of being back in Taiwan where I get to eat all my favorite tropical fruits! The menu offerings differ depending on which day you visit (you can find the schedule online), I think I was there on a Tuesday because I ordered the pork chops. My meal tasted amazing and it was a very generous portion. I ordered accra on the side which was also tasty! Totally recommend this place, and it's very easy to get to (right by Mount Sinai West). There aren't many Haitian restaurants that I know of in Manhattan, so whether it's something you grew up with or you want to try it new like me, Le Soleil is a great place. Sometimes you just want something light but that will fill you up and a nice ambiance to enjoy it in. That's where The Smile comes in. If you like a really rustic, garden Soho vibe and need a spot to hit on your lunch break, this will be great for you. This is also great for meeting friends or a date for dinner. I'm someone who really loves a fancy sandwich now and again (especially ham & cheese), and one lunch I ordered the black forest ham & gruyere from here. The sandwich and little salad that came with it was just the right amount to satisfy me. It's all Mediterranean cuisine here and while the breakfast, brunch, and lunch are for the most part affordable, dinner can get pricey. The location is a very cute basement with secret garden feels. I have been here only once for a friend's birthday, and the only thing preventing me from going back is the high price tag! Miss Korea is one of the most well-known Korean BBQ joints in K-town, and it's definitely more on the fancy side. This was the first time I'd gone to a BBQ place where the waitress/waiter cooks it for you on your table (usually the places I've been to you cook it yourself). There are 3 different floors, I was on the 3rd floor which is "modern" style. The menu gives options to buy sets, which is great for the whole table, or there are individual options and add-ons I believe too. The food is delicious, but like I said it's also pricey. The problem when I went was an extremely noisy table that just totally echoed throughout the area. This place is always busy, but I think it's worth the wait (although dress warm in winter because you'll be waiting outside!). This joint is a last minute entry, due to the fact that I only ate here for the first time yesterday! The Grey Dog is a classic NYC lunch destination for locals, and I've heard the name countless times but never found myself by one to dip in to (there are multiple locations). On a lunch break yesterday afternoon, I visited the location by my workplace with two co-workers and was enchanted by the homey, artist's shack aura decked out with University of Michigan gear. This was my second time inside, but my first time ordering food and dining in. The great thing about this place is not only are there so many OPTIONS (there's bound to be something for everyone), but it's actually AFFORDABLE too! Affordability is a rare thing in Manhattan, and if you want to eat at a real city gem with generous servings that won't break the budget, this is totally the place.